Don’t love the look of an activity tracker? Enter the ‘hearables’ market, which is a new take on activity tracking done through your earbuds. Jabra Elite Sport Wireless Earbuds handle your toughest workouts while playing your music and tracking your movements. This new wearable option is equipped with the ability to monitor including heart rate, counting your repetitions, and even race pace prediction. The brand boasts being the #1 wireless sports earbuds in the United States. Jabra maintains this ranking because of advanced connectivity, excellent sound through your headphones, superior call quality, and a commitment to innovation. Boost your workout experience with Jabra Elite Sport wireless headphones in your ear. With updates like extended battery life and waterproofing, you get the benefit of activity tracking right from your headphones with the Jabra Elite Sport. Your purchase comes with a well-made charging case that holds your headphones in place. It also includes several gel inserts and wings to fit your ear. The product Jabra Elite Sport is all about wearing during workouts, other activity, and even for phone calls. 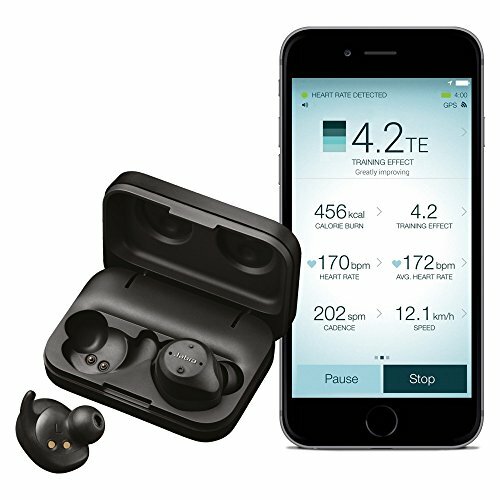 During the development of this product, Jabra intentionally created something for both runners and then delivering a solution for people that like cross-training. Users can comfortably wear one or both earbuds, even during a vigorous workout. The useful Sport Life app makes it easy to track your numbers, during the exercise and also after an analysis of your full statistics. The Jabra Elite Sport comes with a three-year warranty against sweat. In fact, the headphones are water-resistant to handle sweat without breaking down the inner workings of the product. Upon purchase, be sure to register your product, so it is on file with Jabra in case you need a replacement in the future. They are committed to quality, even in the most difficult of workouts. You should not submerge yourself underwater beyond one meter of depth for more than 30 minutes of time while wearing these headphones. Unlike other options on the market, the Jabra Elite Sport works with third-party applications. Jabra has their Sport Life app with a full range of features like heart rate sensing and tracking activity. Beyond that, you can integrate with applications like MapMyFitness, Runtastic, and Runkeeper. This helps the product adapt to your specific needs, mainly if you rely on running applications. 3 hours talk/music time in earbuds. Charging case adds additional 6 hours of battery life. When you purchase a pair of earbuds, one of the primary areas of concern is the quality of sound you get. Jabra has invested numerous resources in boosting music while also keeping you aware of your surroundings. The design of the earbuds includes two microphones in each ear; each receiver works to filter out noise in the background when you are on a phone call and boost the sound in your ears when listening to music. If you wish to use one earbud at a time, the sound experience is also superior. There is a setting called Hear Through that allows a wearer to listen to music while allowing sound from surroundings to filter into the headphones. This is useful in environments like walking in a high pedestrian area, participating in a fitness class with instructions you need to hear, or even listening to music while working. A bonus of this feature is feeling safer when alone at night. When on a phone call, reap the benefits of noise cancellation for both your listening and the caller on the other end. This means each person on the call hears the other party, not background noise. When working out, focus only on your music. When outdoors or in need of situational awareness, activate the Hear Through feature on your headphones. Jabra Elite Sport is designed for people looking to improve their workouts, through statistical information as well as a better listening experience. The Pace Predictor gives users a convenient pace graph with a fitness level as well to help you set realistic goals and understand your real numbers. This is more precise than working with a personal trainer or following a set routine because your body’s specific rhythms are recorded. Once you get your earbuds working for you, the statistics provided by the pace predictor help you set a fair pace for your fitness level. The pace predictor is based on the training you have completed while wearing your earbuds. It calculates your current fitness level based on VO2 maximum to predict your body’s race speeds and recovery times. The Jabra application provides you with a Race Time Predictor based on your pace with other events. Just scan through the numbers to see a 5K running time, 10K running time, and more depending on the distances you typically run. After a workout, the recovery advisor helps you reach your goals with advice about promoting your body recovery. Notifications include a convenient charge showing what percentage your body has recovered, what time of workout would work for you in the future, and how many hours remain until you are recovered. Battery power. Jabra extended the battery life of their product with this iteration of their wireless headphones. The battery of this product delivers four and a half hours of play time and also comes with a portable charging case so you can boost your headphones on the go. This gives a user 13 and a half hours of play time per day. Jabra is always working to extend battery life to its line of products. Exact Fit. Instead of fitting in your ear with the hope that they stay, the Jabra Elite Sport comes with different inserts you can attach for a better fit. Then you can run without feeling your headphones bounce around. These feel custom fit to your ears once you mess around with sizing. Heart Rate Sensor. There are many heart rate sensors on the market, but the Jabra sensor can accurately record your numbers. It is a clinical grade in-ear heart monitor. This also includes heart rate, average heart rate during a workout, and the heart rate zone of your workout routine. Users can also take advantage of the heart rate sensor for resting periods as well. TrackFit Motion Counting Sensor. The sensor that comes with these earbuds provides advanced tracking of pace, distance, step count, cadence, and calories. It can operate with different types of movement and workout routines. An integrated motion sensor also helps detect where you are with higher accuracy. Take Calls with the Earbuds. You can take calls and listen to music with this useful device. This set of headphones is great for making phone calls because it gives a good sound experience on both ends of the call. No matter your surrounding environment, you get superior sound quality for music and phone calls. Recover from Workouts. The Recovery Advisor available with the Sport Life app helps you achieve your goals by giving you exact numbers and times for recovery. Get helpful charts as well as reminders like “2 hours remaining to full recovery” for your next workout. For some users, the three and a half to four-hour battery life on their product does not sustain music for an entire workout, or even a marathon run (for long distance runners). While this is still a small percentage of the population, runners committed to long distances or ultra-marathon distances will not get a long enough battery life for an entire run. However, there are hardly any options for the market for ultra-marathon runners. There are options available, which would include using your charging case on a long-distance run. Running out of battery will only occur with a small percentage of the customer base. In one customer review, “It remains among the best when measured among its peers. Looking for better earbuds? Why not invest in an entire experience with the purchase of Jabra Elite Sport wireless earbuds. These wireless earbuds can sync to your phone for tracking your activity and also taking phone calls. Jabra remains committed to sound quality and battery life for their entire line of products. This highly-rated product, the Jabra Elite Sport, is here to help you reach your goals. Headphones play music to motivate you during workouts, the application record your statistics, the battery life keeps you going throughout the day, and the fit is comfortable for wearing regularly. When integrated with the Sport Life app or your favorite third-party app, you can reach your fitness goals with Jabra Elite Sport. The in-ear heart rate monitor means you don’t need to wear an activity tracker alongside your earbuds. Combine two products into one with the purchase of this high-end listening experience.